Herbert Spencer was best known in the nineteenth century as a philosopher and social theorist. He is now remembered for his key role in the development of concepts of social Darwinism and as the originator of the term “survival of the fittest” (which Darwin first included in the fifth edition of On the Origin of Species). 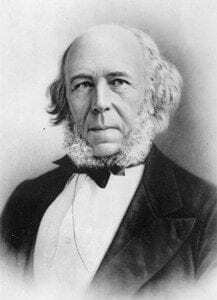 Between 1851 and 1859, Herbert Spencer published a series of important papers that dealt directly with evolution per se – as well as its extension to all other things. They remain a most enjoyable set of readings: Lyell and Owen on Development (1851), The Development Hypothesis (1852), Progress: Its Law and Cause (1857), Owen on the Homologies of the Vertebrate Skeleton (1858), and Illogical Geology (1859). Herbert Spencer’s book Principles of Psychology (1855, read the first edition here) appears to be the first serious attempt to address the evolutionary underpinnings of mental properties. For a concise review of Herbert Spencer’s evolutionary views, see P. J. Bowler’s Evolution, The History of an Idea (third edition) pages 220 – 223. Herbert Spencer’s concise and memorable response to creationist attacks on evolutionary facts and theory from his 1852 paper published in The Leader.